The study aims to emphasize on sensitivity analysis for the total cost of ownership (TCO) to reduce uncertainty by identifying which factors of interest that most likely cause the estimated cost values for the electric bus. The result shows that the percentage change of line distance (km/year), operational years, and investment cost would be the most inﬂuential and signiﬁcant factors on TCO. Published as: Nurhadi, L., Borén, S. & Ny, H., 2014. 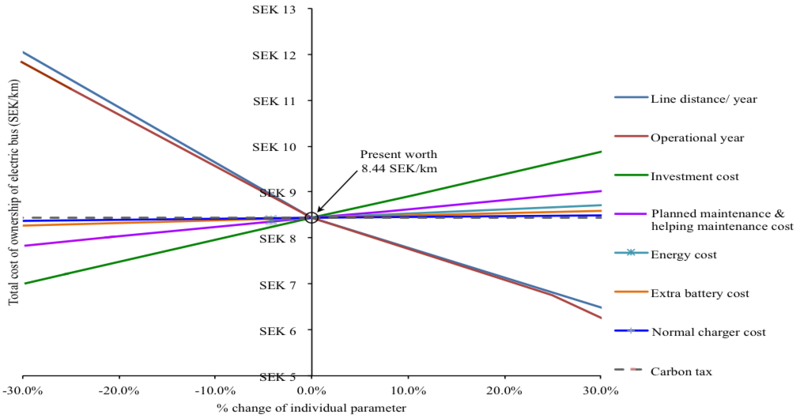 A Sensitivity Analysis of Total Cost of Ownership for Electric Public Bus Transport Systems in Swedish Medium Sized Cities. In Transportation Research Procedia. pp 818–827. How TCO of electric bus A (with 1 extra battery & 2 normal chargers) varies with changes (%) in different parameters.